Posted February 12, 2015: Revised February 17, 2015: Filter Details. February 19: Filter Pictures. March 14: Testing and approving use of test strips to identify the problem filters. 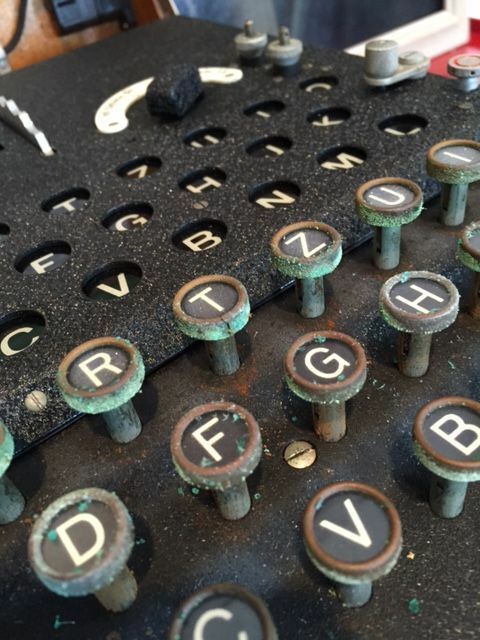 A SERIOUS CORROSION PROBLEM has been identified in certain Enigma machines. We know that this problem has already damaged several Enigmas in as little as 3 years and we suspect that it has damaged many more. It is caused by an easily-identified kind of green contrast filter that is emitting corrosive acid fumes as it ages. This EnigmaMuseum.com web page will explain and show examples of the problem, describe how to identify and test for suspect filters, and offer replacement filters and repair services for damaged Enigmas machines. 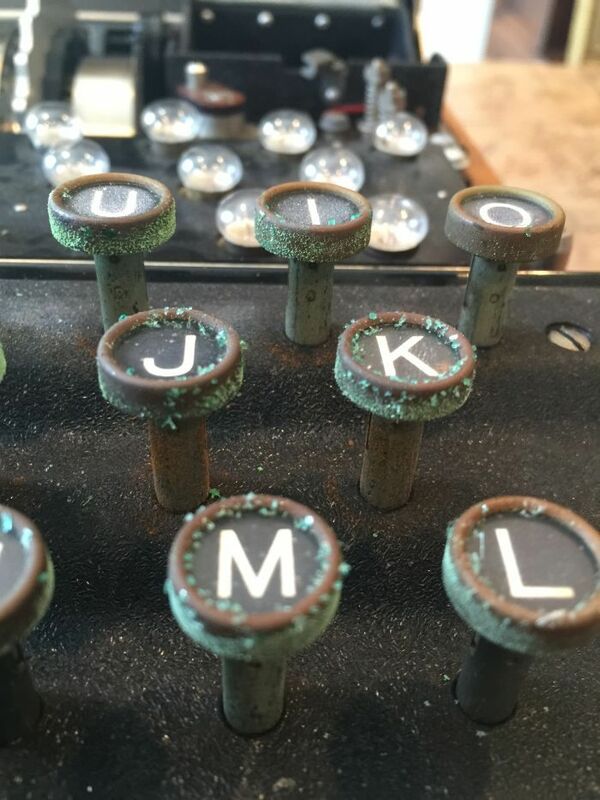 Determine whether you have one of the suspect filters and look to see if you have green corrosion around your Enigma keys or other adjacent metal parts. The corrosion will appear as green mold” or green “rust flakes”. We have identified and photographed extremely serious corrosion of the metal rings around the keys on the keyboards, the metal clips that hold down the filters, and the metal of the spare light bulb panels of two Enigmas and have seen less serious corrosion in other machines. This corrosion is so serious that it has completely destroyed entire portions of the metal ring around several keys and we believe that if it is not stopped it has the potential to completely destroy all of the metal rings around all of the keys as well as damaging some adjacent metal parts. For this reason, our warning must extend to all Enigmas regardless of whether they have metal rings around their key tops. 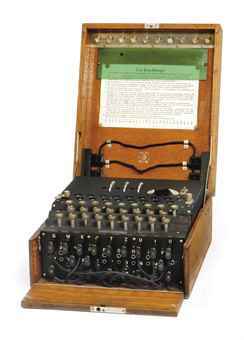 Enigma Museum has been researching and restoring Enigmas for 30 years. Historians Dr. David Hamer and Frode Weierud, and other consultants have been researching Enigmas for even longer. From their databases, we estimate that approximately 10% of all existing Enigmas may have the suspect filters installed. We have researched this problem thoroughly and identified the cause as being Acetic Acid fumes that are given off by a particular kind of Enigma contrast filter stored in the lid of the Enigma. The filters are made of Acetate and give off the Acetic Acid as they disintegrate over time. This phenomenon is well known in the film industry where it is known as the “Vinegar Syndrome”. Most Acetate films and items begin to disintegrate and exhibit the “Vinegar Syndrome” after about 50 years. A suspect filter is shown in the Enigma on the right. When the cover of the Enigma is closed this filter lies directly above the keyboard keys. 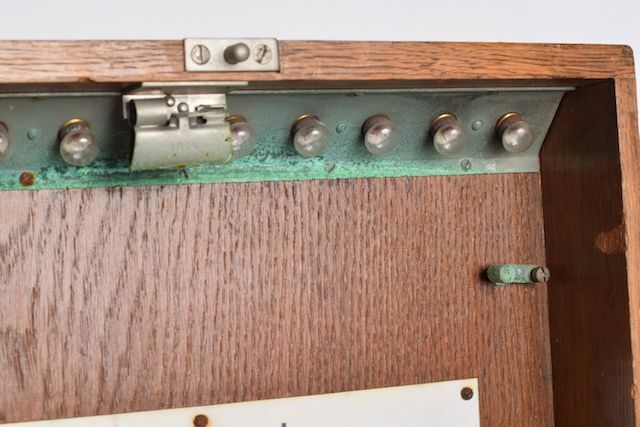 In this closed environment the Acetic Acid fumes build up in the enclosed area under the cover and corrode away the nickel and copper in the metal rings around the keys and other metal parts. You will observe in the pictures below that the worst case of corrosion that we have seen so far is in Enigma A12430. The owner was kind enough to allow us to publish the pictures and tell us about the Enigma. This machine was stored in a climate-controlled apartment with absolutely no exposure to moisture or dampness. We are, therefore, confident that the Acetic Acid fumes coming from the filter are the problem and that the corrosion is not related to any environmental factors. We are not certain whether all filters that look like this one emit Acetic Acid fumes. We have found and tested a way to identify the ones that emit the fumes and strongly suggest that you test your filters if they appear light green like this one. Our recommended test was suggested by archivist Ed Sharpe. The test is described below the following pictures. The information below will help you to determine whether one of these filters is present in your Enigma. Below the pictures you will also see the test and the corrective actions that we suggest. The photographs, details and test in this section will help you to determine whether you have one of the suspect filters. As you can see, the filter is a light-color green and it is not very dense so you can easily see the wood behind it. If you find one of these filters we strongly suggest that you remove it immediately. If you inspect the following pictures of dangerous filters you will see that the color of the dangerous filters is very different from the more dense green filters found in the majority of Enigmas. You can also see irregularities on the surface of these deteriorating filters. Please also see the test that we recommend to provide proof that a filter is safe or dangerous. These pictures show 3 different filters that are known to have caused serious corrosion. We have carefully evaluated ways for you to test your filter for acetic acid fumes. We have tested and recommend the use of a colored test strip. It is accurate, reliable and fast. The suspect filter must be placed in a clean plastic bag along with a test strip for several days. TEST STRIPS: On February 16, 2015, we ordered a supply of test strips that are used by the film industry to test for deteriorating acetate film. They change color in the presence of acetic acid. They claim to be more sensitive than the smell test. When they arrived we immediately put a test strip inside a plastic bag with a suspect filter. Within 24 hours, the normally blue test strip had changed color to the color that indicates the highest level of Acetic Acid. This provided positive proof that this filter was emitting Acetic Acid and that it posed corrosion hazard in any Enigma in which it was installed. 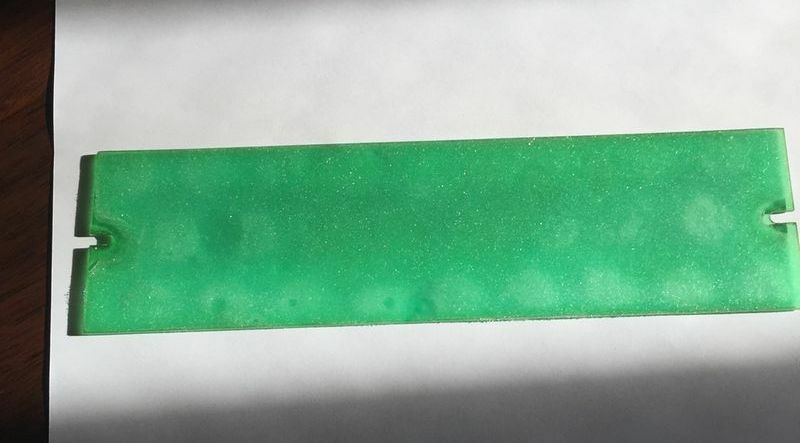 Below you will see the suspect light green filter with the test strip indicating the highest measurable levels of Acetic Acid. The test strip showed this color after 36 hours in the bag. Below this filter you will see the color evaluation pencil that shows the degree of acid contamination. Notice that the color of the test strip is at the extremely high end of the contamination scale. 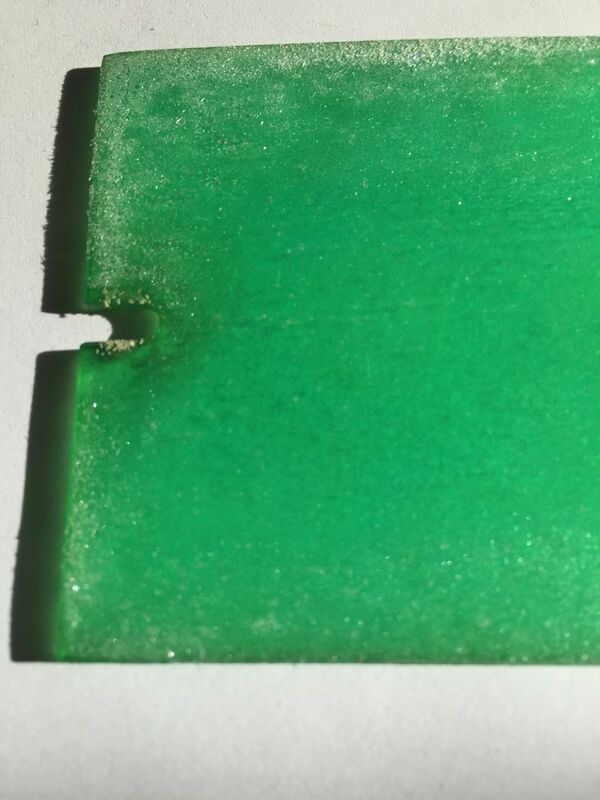 Below this light green filter and the evaluation pencil you will see a dark green filter that has no acid emission as indicated by the test strip that has been in the bag with it for 7 days. This is the type of filter found in the majority of Enigmas. Here is a closer view of the dangerous filter on top, the evaluation pencil in the middle and a filter showing no Acetic Acid emissions below. We offer 2 test strips sent postpaid to anywhere in the United States for $ 5.00 and to anywhere in the world for $10.00 USD. If you need more than two strips you may easily cut the strips into smaller pieces or you may contact us for quantity pricing. 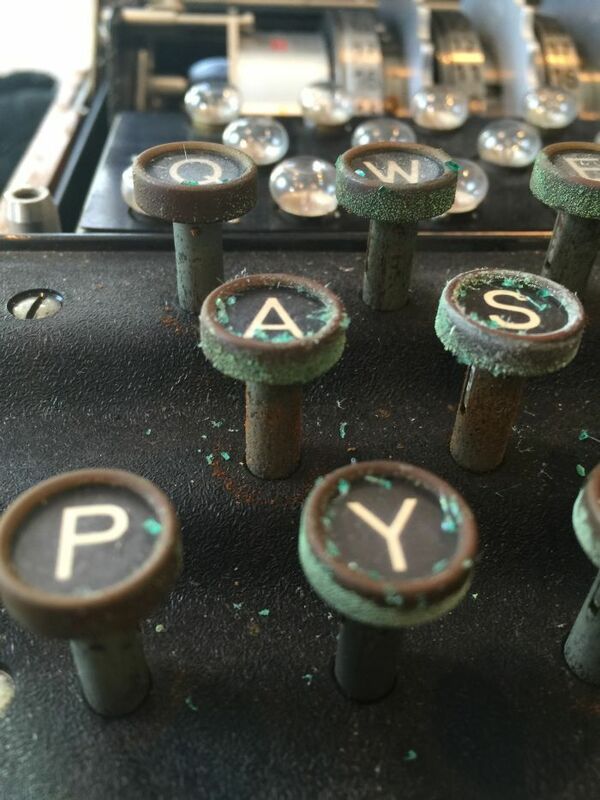 You may send your address and a check or cash to: Enigma Museum, Post Office Box 122, Hancock, VT 05748 USA. DETAILED INSTRUCTIONS FOR USING TEST STRIPS:1. Store unused test strips in a cool place and in a light-proof plastic bag. 3. Wait a minimum of 36 hours and then compare the color of your test strip to the colors on the pencil shown above. 4. If the Blue test strip has changed color toward the yellow or orange end of the scale it indicates that the filter is emitting acetic acid fumes. 5. You may want to consider options in (3.) and (4.) below. Please check back as we continue to revise this web page. 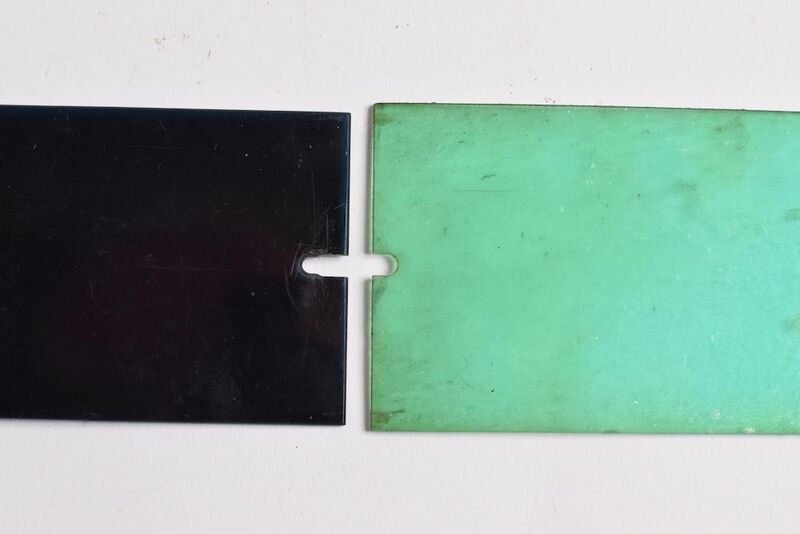 If you have one of these light green filters and/or have corrosion as described above, immediately remove the filter and place it in a plastic bag away from your Enigma machine.Leave the Enigma open for at least a day to dissipate any fumes. We are currently working to understand all aspects and details related to this problem. We are not certain that every light-colored green/blue filter is involved in emitting Acetic Acid fumes so please check this page regularly. If you discover corrosion or a suspect filter, we would appreciate it if you would take photographs of the corrosion and the filter and email them to us along with the serial number of your Enigma. Most Enigmas have their serial number stamped into the base under the rotors. We will add this information into our confidential database so that we can further research and document this problem and hopefully identify serial number ranges and models of Enigmas that have this problem. If you have a suspect filter screen you may consider ordering a replica green light filter. Green light filters made to historically correct size and color specifications are available for $250 USD plus postage and in exchange for your filter. We would like to collect as many of these suspect light green filters as possible to analyze and identify any differences among them. Please email or telephone us to order these replica filters. 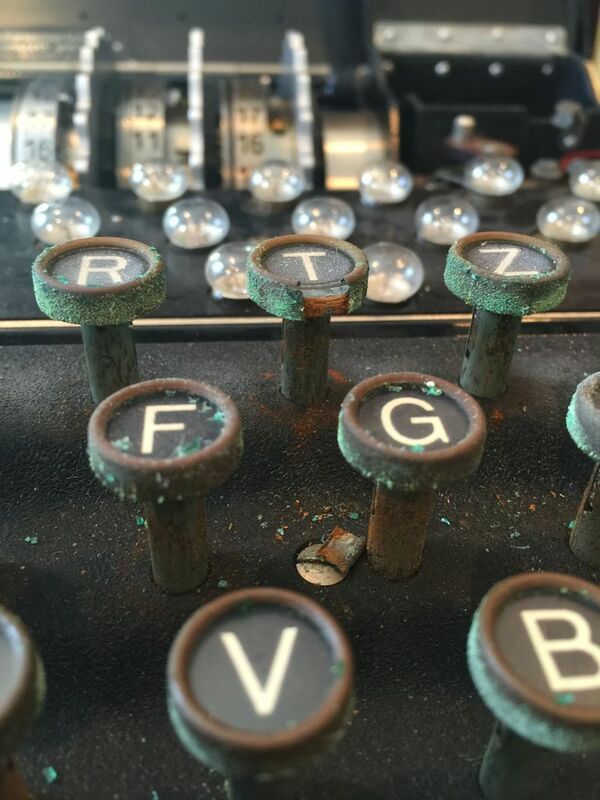 If your Enigma has been seriously damaged you may contact us for an estimate for repairing the damage. We have developed techniques for restoring corroded key rings to their original appearance. 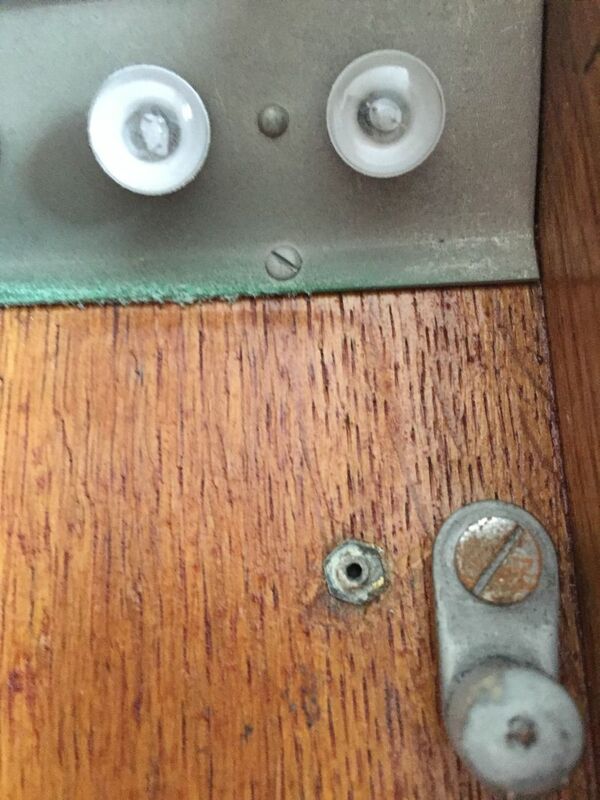 If the corrosion has destroyed part or all of the ring, we have developed a technique that allows us to fit a replacement ring in place around the original key top so that it exactly restores the original appearance. Please email or telephone to discuss these options. PLEASE HELP us to spread this warning …and urge every owner of an Enigma to check their machine for the suspect filter, remove it if it is present, and notify us of the serial number and any known history of their machine. 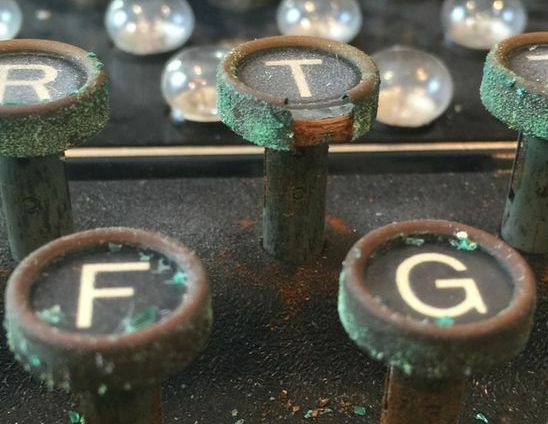 A database of serial numbers and photographs of Enigma machines with this type of corrosion damage is being constructed. It will be kept strictly confidential. It will be used to try to identify Enigma models and serial numbers that are affected. Photographs of affected Enigmas will be added to the bottom of this page only with the owner’s permission. Please check back as we develop this page. As of March 14, 2015, we have not found any correlation between the presence of suspect filters and Enigma serial numbers that cover the entire range from the 1920s though 1945. If you have concerns or questions regarding this information, please feel free to contact us. 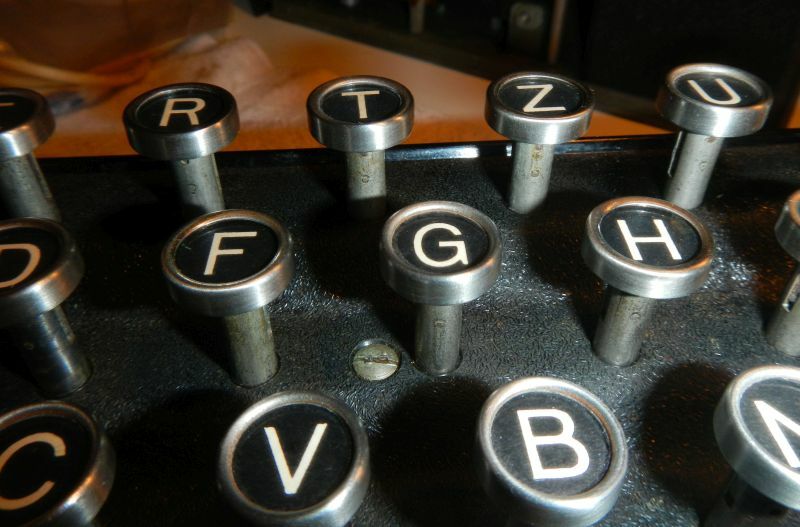 Enigma Museum has been researching and restoring Enigma machines and related cipher equipment for more than 30 years. For more information about our company, visit the “ABOUT” page on our web site. 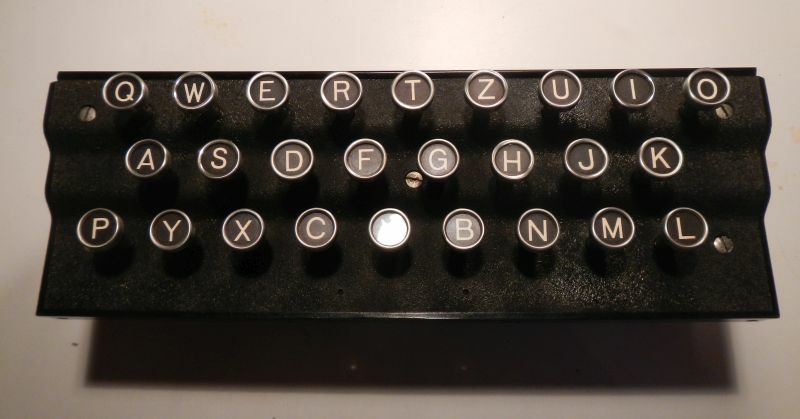 BEFORE: This Enigma keyboard is in excellent condition on the day that this green filter was installed inside the top cover: The owner photographed it on the day of installation of the filter. BEFORE: This Enigma was stored in an environmentally controlled room with the lid closed and a corrosive filter in the wooden top. Severe corrosion damage resulted to the keys as well as other adjacent metal parts of the Enigma. AFTER REPAIR WORK COMPLETED: This Enigma required the repair and replacement of select keys that were severely damaged by corrosion from the light filter.